Imagine that you search for, say, a blender on Google one afternoon, then that evening when you sit down on your couch to indulge in a little mindless Big Bang Theory video-streaming entertainment, you’re treated to Sheldon and Leonard* in a bit of madcap smoothie-making madness with a seven-speed Oster BVCB07-Z. Your next-door neighbor, however, whom the all-seeing intertubes know to be of more modest means, sees the same hijinks – but they’re taking place with a low-rent Oster 6706. This video shows how the technology works. Are You Screwing Up Your Best FREE Marketing? Testimonials are the best marketing you can use because they're so persuasive - and they shouldn't cost you a dime! 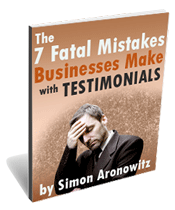 But I see so many businesses screw up their testimonials by making up to 7 Fatal Mistakes. Find out what these mistakes are by downloading your copy of my free report. Just enter your information below to be sent your free copy.